ordered military prosecutors to provide a detailed account of their discovery of evidence that could help PFC Bradley Manning’s defence. The ruling came in response to a motion by lead defence counsel David Coombs, who cited misleading statements made by government lawyers about their efforts to locate required materials. The Obama administration can’t hide from reality forever. Any ruling in favour of the truth is a victory for Bradley Manning, because the government’s strategy of abuse, obfuscation and outright deception simply won’t stand the light of day. Further report on the day’s proceedings by Kevin Gosztola. About 15 people came today for an hour vigil. we stood in silence, then we gathered into a circle, introduced ourselves and John McClean from New Zealand played his guitar and sang a couple of songs. 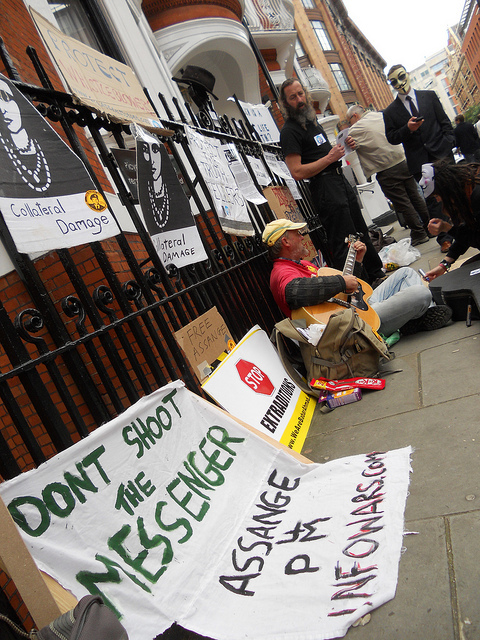 After the vigil, eight of those present went to the Ecuadorian Embassy to continue the ongoing solidarity presence there for Julian Assange, currently staying in the embassy and seeking political and protective asylum in Ecuador. 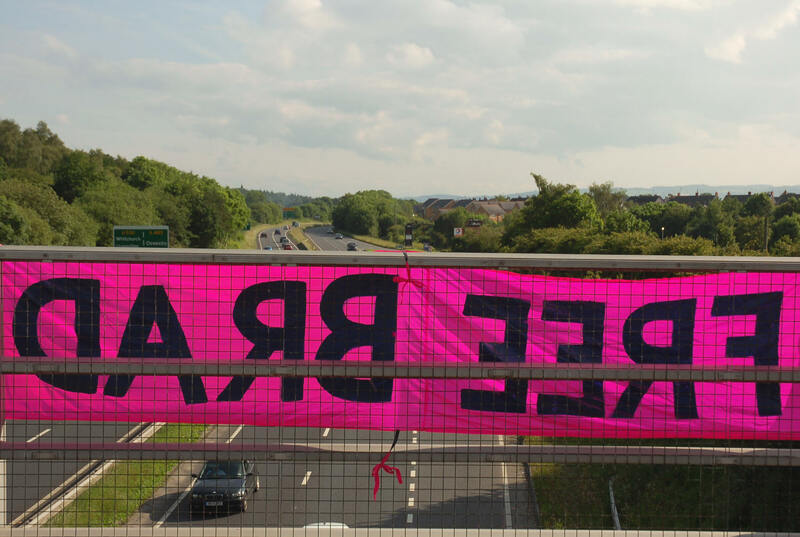 In Wrexham, banners reading “Free Bradley Manning” and “End the Wars”, along with a rainbow peace flag, were put up on bridges over the A483 trunk road, near Pandy in the morning, and again during the evening rush hour near Ruabon. 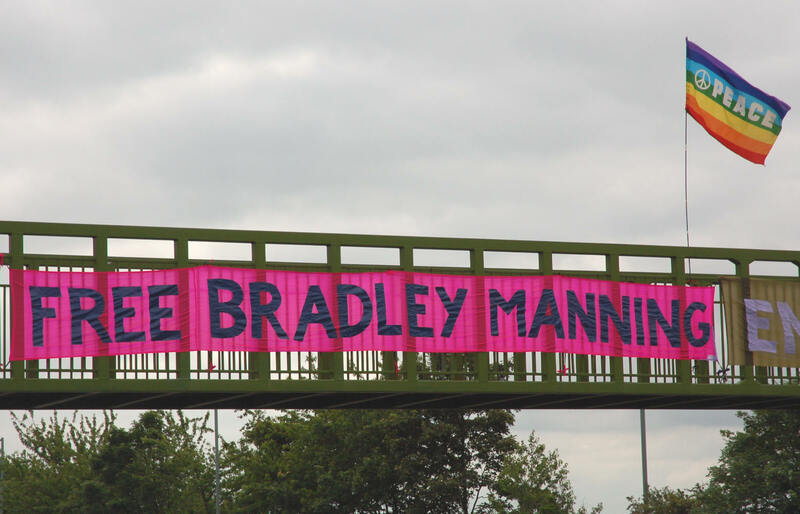 I hung the banners to draw attention to Bradley’s plight in the hope that people who see them will be inspired to find out more about the case, especially given Bradley Manning’s Welsh connections. The files Bradley is accused of passing to WikiLeaks have revealed the ugly truth about the wars being fought in our name. 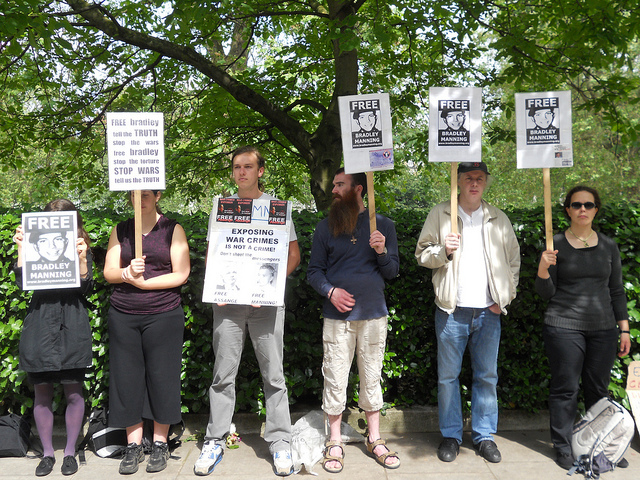 As an anti-war activist who has also been a whistleblower, I stand in solidarity with Bradley Manning and Julian Assange, both of whom are being persecuted for speaking truth to power. More reports from Wrexham at indymedia.org.uk and wrexham.com. 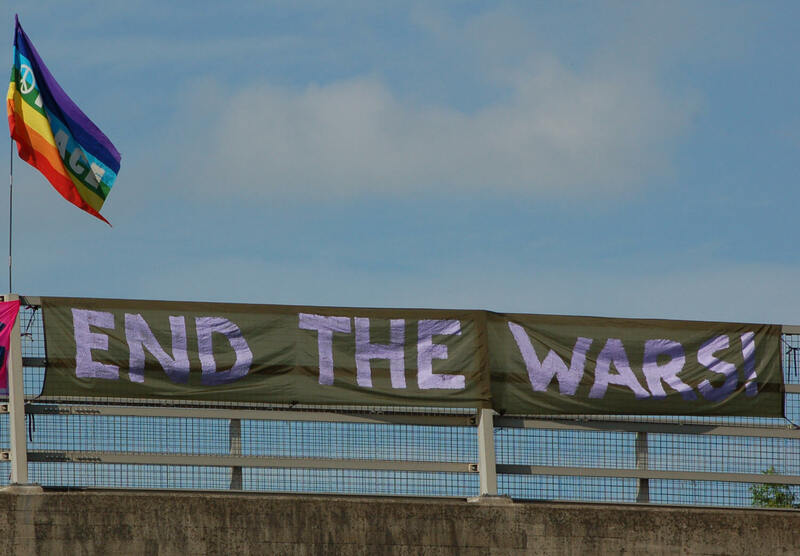 Gallery | This entry was posted in Assange, Manning, Reports and tagged anti-war, Bradley Manning, Britain, Catholic Worker, London, solidarity, Wales, Wrexham. Bookmark the permalink.